GM’s Australian brand Holden has unveiled the newest iteration of their popular VF Commodore – giving us our first look at the Chevy SS performance sedan that will debut later this month at the Daytona 500. As you can see in the images on the right, it isnt exactly the Chevy SS that we are looking at but instead, we get our first glimpse of the car that will be the SS in its current form – the Australian sold Holden VF Commodore. We don’t get a world of details on the Commodore so it is unclear what drivetrains the Aussie version will get but these shots give us a great look at the upscale, powerful lines of the big GM rear wheel drive sedan. Like the previous generation Commodore (and the Pontiac G8), the new VF Commodore has a long, low profile and a wide stance that works with the almost fastback-like trailing edge of the greenhouse to give the car a very muscular feel as sedans go. While the Commodore (or possibly the Chevy SS) doesn’t really look like the upcoming 2014 Chevrolet Impala, there are familiar styling cues between the two including the basic shape of the upper and lower grille area along with the angular LD driving lights. However, where the Impala is clearly designed to appeal to a buyer seeking luxury first, the Commodore is designed to appeal to those who want a large sport sedan – a point which is clearly evident by the chiseled chin of the big Holden sedan. Along the sides, the new VF Commodore wears a front fender vent that could be borrowed from the 2014 Chevrolet Corvette Stingray, which is a nice upside for the sedan in the US market. A low, long roofline gives this large sedan a slippery shape while the minor wheel openings and broad fenders, doors and quarter panels give the Commodore a big, powerful form. When the Chevrolet SS debuts at the upcoming Budweiser Speedweeks that are punctuated by the 2013 Daytona 500, it will be based directly on the physical design – both inside and out – although it is unclear whether or not GM will tweak the exterior design to give the SS a personality of its own. Mind you, the look of the new VF Commodore is a big step up from the vehicle that Americans knew as the Pontiac G8 with an obvious emphasis on upscale, high tech design but the American automaker might introduce some minor styling alterations to help the SS stand out from the Commodore. Even if the Chevy SS is literally nothing more than a rebadged Commodore when it arrives later this month, it should still prove to be much more popular with the American buyer who expects that upscale design from their new large sedan. Having seen more than a few of the new Chevrolet SS test mules touring around the Milford Michigan area with heavy camo, there is one aspect that seems to be absent from the new Holden Commodore. The Chevy SS mules have vents in the camo on the hood which suggests that there are heat extraction points similar to those seen on the new Corvette or the Dodge Charger SRT8. The Commodore shown above is a luxury trimline where the SS will be a performance model so perhaps GM will have a hood that caters more to the high performance attitude of the new SS sedan. This is, after all, the car on which GM has based their new NASCAR race cars for the Sprint Cup Series. 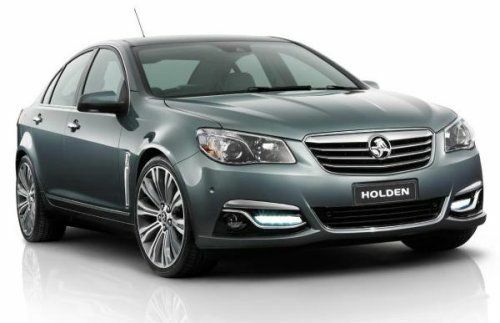 This is the second time in recent history that General Motors has attempted to capitalize on the popularity of the Holden Commodore in the US market; having introduced the Pontiac G8 for the 2008 model year. Unfortunately, by that time Pontiac was already in a tailspin towards the automotive afterlife and when you combined the decline of the brand with the fact that the G8 fell far short of the competition – it comes as no surprise that the powerful Pontiac sedan never achieved the success that the company had hoped for. However, with the introduction of the Chevrolet SS, GM expects that this vehicle will resonate well with the American buyer thanks to the new name and the simple fact that the new VF Commodore-turned-SS is so much better as a whole than the Commodore-turned G8. When the Chevrolet SS performance sedan hits showrooms later this year, we would expect that it will be powered by a very similar drivetrain to that offered in the current Chevrolet Camaro lineup; including the 3.6L V6 and the 6.2L V8 – although it has been suggested that the SS sedan will derive its big power from some derivative of the new LT1 V8 found under the hood of the Chevrolet Corvette Stingray. There could also be a higher performance model packing some forced induction power to help the new SS compete with the Dodge Charger across all of its trimlines – including the 470hp SRT8 package. The formal debut of the new Chevrolet SS road car is expected to take place on February 16th in Daytona so that all of the race fans coming to the track for the weeks of racing have a chance to check out GMs newest rear wheel drive large sedan for the US market. Click any of the thumbnails above on the right or below of the Holden VF Commodore for a look at this new sedan. "The G8 fell far short of the competition..." How? How many four door, V8, affordable sedans did the competition have to offer? I tried to buy a G8-GT and found the sales department to be rather unconcerned as to whether it sold the car or not. It was a great car with mediocre marketing and mediocre GM leadership support. The car deserved better and under current GM leadership may enjoy a second coming.